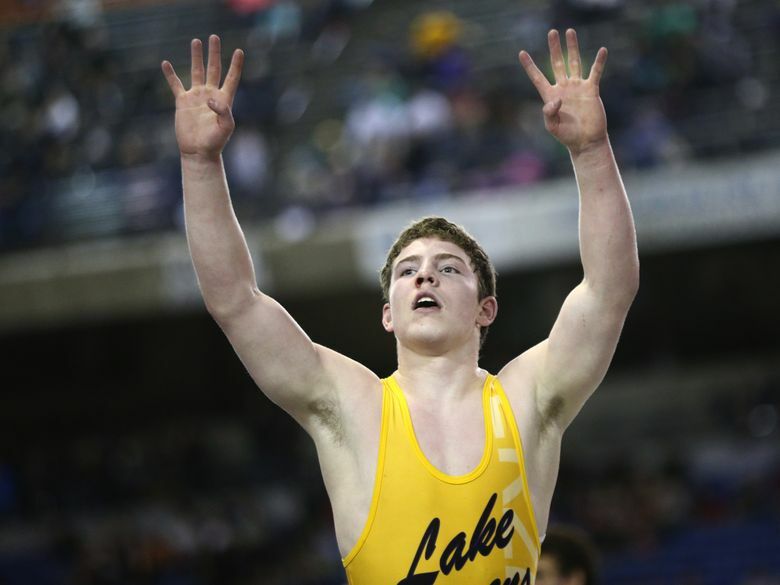 Soler became just the 13th four-time state wrestling champion on the boys side at Mat Classic XXVIII Saturday at the Tacoma Dome as he held off Hudson Mauseth of Moses Lake in the 170-pound final, 14-5, capping an outstanding tournament by his Lake Stevens team. TACOMA – Michael Soler’s emotions ran the gamut. He was completely gassed yet almost giddy. Physically exhausted, but mentally elated. And he stands tall in elite company. Soler became just the 13th four-time state wrestling champion on the boys side at Mat Classic XXVIII Saturday at the Tacoma Dome as he held off Hudson Mauseth of Moses Lake in the 170-pound final, 14-5, capping an outstanding tournament by his Lake Stevens team – which took the overall title for the third time in four years and 10th overall. He is the first to win all four titles in Class 4A. Burke Barnes, the coach’s son and Lake Stevens’ only other four-timer (1999-2002), won his first three in Class 3A and the last in 4A. Barnes practically tackled him after the win and together they posed for pictures, each holding up four fingers. Soler was one of two Lake Stevens champions as senior Trysten Perales won at 145. Overall, seven of the team’s eight state qualifiers placed and the Vikings pulled away from Moses Lake, last year’s winner, 121-103. Tahoma took third (89) and Curtis fourth (74). Jake Douglas fell short in his bid to win at 138 (after taking second there last season), losing 2-1 to Decatur’s Leviticus Arizpe in the semis, but he bounced back to finish third and contribute key points. Sophomores Nathan Scilley (113) and Malachi Lawrence (160) also earned third-place medals. Derek Freitag, meanwhile, pitched a shutout in his final tournament to become Kentridge’s first two-time champion. He not only pinned his way to the 113-pound final, he didn’t give up a point along the way. Then the likeable senior shrugged off the accomplishment. “That’s just hard work,” said Freitag, who gave up only two points since his lone loss in the Tri-State tournament two months ago. Arizpe won his first state title, and celebrated with a backflip. Well, himself and Mike Bressler, who was coaching his final match after 18 seasons with the program. Arizpe said he was determined to become Bressler’s ninth and final champion. “I really wanted him to go out with a bang,” he said. Adrian Avena of Beamer joined the fun by upsetting top-ranked Dante’ Springsteen of Bethel in the 152-pound final, 7-5. He, too, celebrated with a backflip. Then there was Kent-Meridian senior Emmanuel Daigbe, who capped his second straight unbeaten season with a second title, this one at 195. “I just treated it like another match,” he said. One of the most emotional winners of the night was Andrzej Hughes-Murray of Federal Way, who screamed and cried and pounded the ground long after taking the 220-pound crown. • Josh Franich, a junior from Puyallup who is hearing impaired, took home the crown at 132 after coming in ranked No. 5. He pinned top-ranked Cam Sorenson of University in the semis and beat Central Valley’s Bridger Beard 9-0 in the final. Beard’s older brother, Bryson, won his second title by beating Tahoma’s Nick Whitehead in the 126-pound final. • Andrew Harris of Mount Si wound up sixth at 220 after getting pinned by Hughes-Murray in the semifinals. • Beamer senior Mitchell Owens added another third-place medal to his cache, although he came in ranked No. 1 at 182. Owens was third at 170 last year.